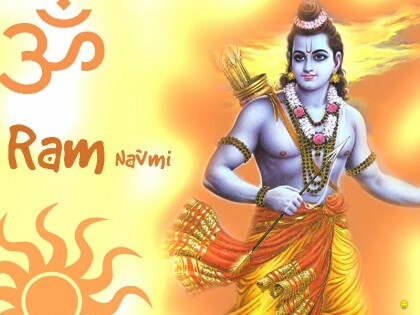 Ram Navmi, is a Hindu festival celebrating birth of Lord Ram. Lord Ram is believed to be seventh incarnation of Lord Vishnu. Shri Ram Navmi is celebrated on ninth day(navmi) of chaitra month of hindu lunar year, in waxing moon (shukla paksha). This festival is celebrated with immense joy and enthusiasm all over India. In South India, this day is celebrated as wedding anniversary of Lord and Sita. In Ramayan, Dasarath was king of Ayodhya. He had three wives, Kaushalya, Sumithra and Kaikeyi. King Dasarath was nat blessed with a child, so he and the people of Ayodhya were worried as they had no heir to their kingdom. Rishi Vasistha, suggested him to perform, Putra Kamesti Yagna, to get desired child. King Dasarath agreed to this and went to meet Maharshi Rushya Shrungain, who gave his concent to solemanise the yagna. As a result of yagna, Fire God appeared and handed a bowl of payasam to king Dasarata, and asked him to give it to his wives. He gave one half to Kaushalya, other half to Kaikayi. And they two gave one half each of their payasam to Sumithra. After few days all the three Queens conceived Dasratha’s child. On the ninth day (Navami) of Chaithra month of Hindu calendar , at noon Kaushlya gave birth to Lord Sri Ram, Kaikeyi gave birth to Bharath, and Sumithra gave birth to twins, Lakshman and Shatrughan. This was a great day in Ayodhya and since then this day is calebrated as Ram Navmi festival. Temples are decorated, special hawans are performed, along with the chanting of vedic mantras. Image of baby Ram is placed on cradle and is rocked by devotees, with singing of bhajan and kirtan. Many Hindu keep fast for the day followed by feasting in the evening. Along with LOrd Ram people also worship Sita (his wife), Laxman (his brother) and Hanuman (his ardent devotee). In the evening a special Ram Navmi procession is taken on street. In South India, Sitarama Kalyanam, i.e.ceremonial wedding of the Lord Ram and Sita are performed by the priests at the temple. At the end of the day the deity is taken to a procession on the streets, with great fanfare and accompanied by group chanting of name of Rama. The important celebrations on this festival take place at Ayodhya in Uttar Pradesh, Bhadrachalam in Andhra Pradesh and Rameswaram in Tamil Nadu, thronged by thousands of devotees, and Rathayatras, the chariot processions, also known as Shobha yatras of Rama, his wife Sita, brother Lakshmana and devotee Hanuman, are taken out at several places, including Ayodhya where thousands of people take a dip in the sacred river Sarayu.